HAPPY NATIONAL CANDY APPLE DAY! The red candy apple was created by William W. Kolb in 1908 while experimenting with cinnamon candy for his Christmas inventory. He had a batch of red cinnamon candy and dipped a few apples in the mixture to display in his window. They proved so popular he continued the practice each year in fall and soon the entire Jersey Shore had candy coated apples for sale. 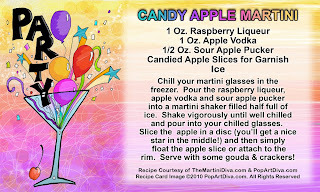 Because hardened sugar is difficult to achieve in humidity, candy apples are rarely found in the spring and summer months in many parts of the U.S., one of the reasons why this treat is so closely associated with Fall. By the way, don't confuse the candy apple with toffee, taffy or caramel apples! While toffee, taffy and caramel apples are certainly candy apples, a candy apple is not always a toffee, taffy or caramel apple! 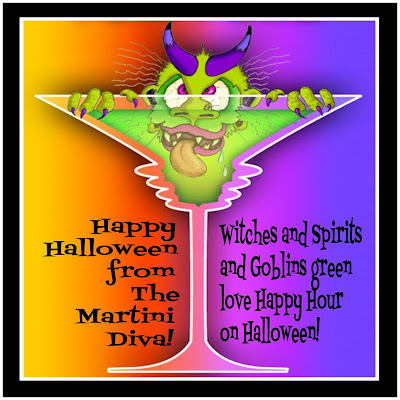 The Halloween Night Martini is a citrus and raspberry flavored treat of the Halloween darkness with just a few silver stars sprinkled in to light your way as you go about your tricks.